Generator is a highly accurate and versatile audio signal generator. It generates sine waves, square waves, white noise, and pink noise. The white and pink noise can optionally be octave-band filtered. All waveforms are highly accurate and low-distortion, created with real-time 64-bit floating point math and ANSI / IEC type 1 filters. NEW! Generator includes a remote-control mode, where the app can be operated from AudioTools running on another device, as long as both devices are on the same WiFi network. NOTE: If you plan to purchase iAudioInterface, you should instead download AudioTools and buy this app as an in-app purchase. Generator also incorporates a pseudo-balanced output mode, that inverts the output signal polarity to one channel. When used with our iAudioInterface, you will get a signal that can be used for plugging into a balanced input. 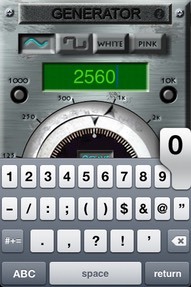 You can have a low-distortion, accurate signal generator on your iPhone. Check our specifications section below for more details. First, to get a signal playing, turn off the mute (so the blue text goes away), turn up the fader on the bottom of the screen, and turn up the ringer volume on the side of the phone. You should now be able to hear something. Next, select the signal type using the buttons on the top of the screen, and frequency, using the dial. The output automatically switches between the speaker (on the bottom of the iPhone) and the headphone/line out when you plug headphones or an audio cable into the iPhone. For sine waves and square waves, there are three different frequency selection modes. These modes are chosen by using the buttons in the middle of the dial. In concept, the outer ring selects the octave, and the inner ring selects the place in the octave. If the inner pointer is straight up, you are in the center of the octave. If the inner ring is 1/3 to the left, you are one-third octave below. The inner rings works differently, depending on the mode selected. If you select octave mode, when you turn the dial the frequency will settle on even octave frequencies: 31, 63, 125, 250, 500, 1k, 2k, 4k, 8k, or 16kHz. In this mode, the fine ring will always point to the top to indicate that it is set to the center of the octave. If you select third octave mode, then when you turn the dial, the inner ring will settle on even third octave points. If you move up or down to the next octave, the outer ring will move to the appropriate octave. In fine mode, the dial moves freely, and you can select virtually any frequency. Note, that at higher frequencies you may not be able to select every single Hertz number, but you will have very fine control of the frequency. In this mode, as you move up or down to the next or previous octave, the outer dial will move to the appropriate octave value. Enter any integer frequency value from 20 - 20,000 and the generator will immediately set that frequency. Note that the keyboard input is only active for sine and square waves. Tap the Return key to dismiss the keypad. If you touch either the 1000 or 10k button, the frequency will instantly set to either 1000Hz or 10kHz. This is useful if you are doing tests on equipment, and need to quickly access these values. All settings are saved as you change them, so the next time that you start the Generator it will start as you left it. You can use the level fader to set the relative output volume. Each waveform has its own level setting that is accessed automatically as you change waveforms. NOTE: The hardware level, set using the buttons on the side of the phone, set the overall output level. Most of the specs for Generator depend on the iPhone or iTouch. The waveforms are created using 64-bit floating point math, and as such are extremely accurate. Here are some measurements that we have made using an iPhone 3G. We will add more specs as we measure them. We have measured a max of +6.35dBu balanced, using our Balanced Cable Adapter. This is with the system volume (set on the side of the phone) set to maximum, and with the fader on the screen set to max. The distortion that we measure is less than .006% THD. 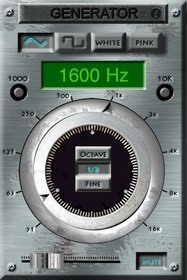 The same distortion value is measured at the octaves, at 32, 63, 125, 250, 500, 1k, 2k, and 4kHz. Note that in previous software versions, it was necessary to lower the hardware volume by one click to avoid high distortion levels. That is corrected in the current release. These levels are for reference, and have been measured with an iPhone 3G with the hardware volume set to maximum. All values are in dBu, using our balanced cable adapter. For unbalanced levels, subtract 6.0 dB.